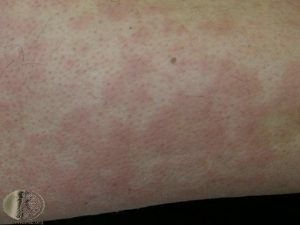 1 What is Erythema Marginatum? 2 How long does Erythema Marginatum last and what are its characteristics? 4 Causes of Erythema Marginatum? 8 Who are at risk? Erythema Marginatum is a rare skin disease usually accompanied by rheumatic fever caused due to bacterial infection. It causes rashes marked by pink or red circle patches. Erythema meaning red and Marginatum is the Latin form of the English term ‘margin’. So signified by its name, the margins of these ring-like rashes remain visible, the center remains flattened, and the reddened edges are elevated. How long does Erythema Marginatum last and what are its characteristics? It may last for months which appear and disappear and again reappear over the course of several months. These reddish circles are mainly results of allergic reactions caused by various drugs, chemicals, or may occur due to some unknown reason. They are prevalent in the trunk, mostly the upper portion of the body, inner regions of arms and limbs and primarily seen on the surface underlying the extensor muscles. However, the face, palms, and soles of feet are not affected in maximum cases. But an issue with this they go unnoticed as they are neither painful nor itchy. Hence, in most cases, it gets ignored. Erythema marginatum rheumatism is the type that is accompanied by rheumatic fever and develops on the trunk and seen on the inner surfaces of the limbs. It occurs as multiple eruptions and spreads all over, but is superficial in occurrence. Chronic Erythema Marginatum perstans develops in the deeper areas of the body apart from the palms of hands and soles of feet. Their growth is in the form of lesions and distributed throughout the surface of the skin. This category reappears on frequent periods and erupts on a permanent basis. 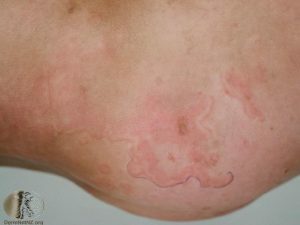 Erythema Marginatum affects mostly light-skinned people. It is commonly found more in males than in females and can affect people of all ages. 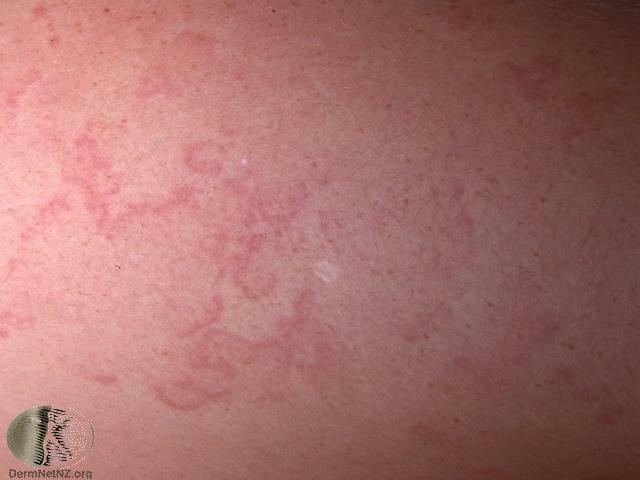 These rash circles measure about 0.5-2 centimeters in diameter and are spread out eruptions on the body. Rheumatic fever: Streptococcus pyogenes is the affecting bacteria that cause this disorder. Ring-like structures are produced on the skin and they affect the heart, joints and even the brain. Acute high fever increases the risk of these projections and turns more serious. It is common in children in the age group of 5-15 years, but it can affect anyone. Being painless, they often go unnoticed and can reoccur within days or several months. Lyme disease: It is an infectious disease caused by Borrelia burgdorferi, a harmful pathogen that enters the human blood through infectious bites of ticks. It is found explicitly in North America. Hypersensitivity or allergic reaction: Extreme reaction or intolerance to the stimuli or other agents may produce this type of allergic outbursts on the skin. Mostly these are caused due to food allergies, particularly blue cheese and tomatoes are prominent in this case. Malignancy: Chronic ailments such as breast cancer, leukemia, lymphoma and several other life-threatening diseases may also cause these symptoms and produce rashes. Infection: Reactions caused due to various infections may also result in the onset of small red eruptions. Escherichia coli, Candida albicans or Ascaris lumbricoides are some of the infectious agents. Adverse reactions to drugs: Regular use of anti-malarial chloroquine or hydroxychloroquine, gold, penicillin, and cimetidine can be factors for these eruptions due to an adverse effect on the patient. Hormones: Pregnant women are more likely to suffer from this type due to hormonal changes. Also during the onset of puberty in children of 15 years or those who have already entered their puberty stage may suffer from Erythema Marginatum as they undergo a hormonal change. Intense pain in joints of knees and elbows. The disorder can be diagnosed depending upon the accurate observation and examination of the skin conditions. Also, skin specialists should check the medical history of the patient which is equally necessary to check if any other disease can be the cause of this rash or any reaction to a drug or chemical. A biopsy is often required to check if other acute disorders are associated with these eruptions. A small section is removed from the outermost layer of the skin for a biopsy. This disorder can be confused with similar conditions like erythema nodosum, erythema migrans, and erythema multiforme. 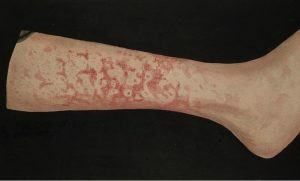 Erythema migrans may appear due to an infectious tick bite and can occur within a month after the bite. It is similar to Erythema Marginatum, but the only factor differentiating them is that the former has a bull’s eye appears in the middle of the eruption which is not present in the latter. Erythema multiforme usually has a mild itching sensation, but in severe cases it is extreme. However, the rashes are non-itchy. Also in both the conditions, it varies in appearance. The disorder also shows similar symptoms as of Hives or Urticaria, a disorder where the person is affected by red itchy elevated patches on the skin of different shapes and sizes. These are mainly caused due to drug reactions. But the major difference is that the rashes in Hives or Urticaria are not visible while itching. Anyone, be it a child or an adult with rheumatic fever may suffer from this disorder. Reactions to chemicals, various drugs, poorly maintained sanitation facilities and several harmful environmental issues can increase the risk of infection by the strep bacteria. Erythema marginatum itself does not cause any complications, even if it lasts for weeks or months or even years together. However, it results in producing skin rashes and inflammation. Since it is not a disease in itself, it has no complications as such. That being said, in a few cases, the soft membranes of the heart may be affected due to the decreased blood flow or leakage of the valves caused due to inflammation. However, the condition does not act fatally and is easily recovered by a proper diagnosis of the bacterial infection causing rheumatic fever. Intake of antibiotics for a prolonged treatment can help in preventing the repeated occurrences of fever. Good news is that experts are trying their utmost to invent a vaccine which would prevent rheumatic fever completely curing it, and as a result, the possibility of the occurrence of Erythema Marginatum can also be eliminated. But it must be kept in mind that certain drugs or medicines can worsen the condition. Also, avoid allergic foods which may trigger irritation. If the patient suffers from recurring rheumatic fever for three to five consecutive years, it is highly recommended to consult a doctor. If the valves and membranes of the heart get affected due to inflammation, it may lead to life-threatening diseases.